This weekend Patti and I went to Phoenix to get our taxes done. We all go to the same lady, Patti and all of her sisters, so we make a party out of it. 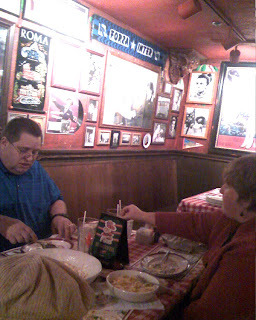 After we were done with the business of taxes, we all went out to dinner at Buca di Beppo's. It was great! 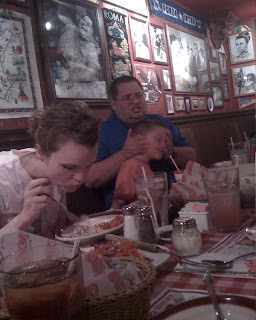 Buca di Beppo's is a fun Itallian restaurant, that serves dinner family style, so everyone has to agree what they want. There were 9 of us there, and we got two large pasta dishes, and a small eggplant parmigana. Well we took enough of it home wih us after eating, that we could have it for lunch today too. GOOD FOOD! 2 larges and a small can probably feed 15 people. Ha ha ha! Especially if 3 of them are bariatric patients. Anyway it was a good time! We'll have to do it again someday. 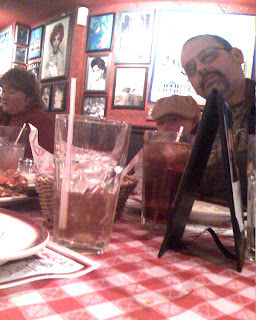 YUM YUM is right thanks for taking us out to eat.